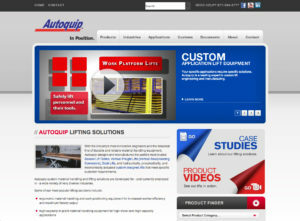 Autoquip has a broad line of durable and reliable material handling equipment. that meet specific customer requirements. Autoquip custom material handling and lifting solutions are developed for – and currently employed in – a wide variety of very diverse industries. And because each custom lift begins with a standard lift selected from our vast catalog of standard lifting options, we are able to engineer highly specialized adaptations and provide custom lifting solutions at near standard prices. Autoquip lifts have been designed and manufactured in America’s heartland since 1947. And as the industry leader in standard and custom material handling equipment, we’re proud to provide you with the industry’s most reliable lifting solutions at the industry’s lowest possible costs.